October 15th, 2013 - Posted by Steve Marks to (X)HTML / CSS, Software, Web Development. Have a quick search for the phrase ‘PSD to HTML conversion‘ and some of the results returned will probably be adverts for software that can allegedly turn your Photoshop files into HTML at the click of a button. The code produced from our test runs was not just sloppy, it was unusable. All the HTML elements produced were absolutely positioned (meaning they’re positioned at an exact distance from the top and left of the screen) as well as a fixed height and width. This is fine but what happens if you add extra text in the future, or if a user zooms in on their browser or phone? Elements start to overlap each other and the site looks a mess. For a complex site there’s a high chance that the HTML produced doesn’t exactly match what was in the original design. I know some conversion software does indeed keep the text as it appears in the Photoshop file. However, the outcome from some of our tests also found that the text in the PSD was converted to an image. This means that a) it’s then not editable going forward and b) it holds no SEO value. A good developer will optimise the HTML for search engines by default by structuring the code in a certain way, adding alt tags to images and more. I don’t believe that any conversion software, no matter how good, can ever do this. If SEO is important to you, at the very least you’re going to want to edit the HTML after it’s been produced. The World Wide Web Consortium (W3C) is an international community that sets the standards of the web. I’ve discussed previously why it’s advantageous to meet these W3C standards. With that said, code done by a good developer should closely meet these standards. Put plainly, code produced by software will not. We ran a PSD with just 30 layers through a converter and it came back with 47 errors. When exporting images manually in Photoshop there are a number of things you can do to ensure that they export in the best format and the least filesize. The software doesn’t seem to be able to make these decisions and will export images as they are. Ultimately this will have an impact on the page loading times. If the PSD in question is for your new website, you probably want to think about making it accessible on tablets and smartphones. For the past couple of years this has been done by making a site responsive and thus, ensuring it arranges itself based on the device being used to view the site. Using software to perform the PSD conversion will completely fall down on this step and will make it very difficult for your site to be responsive, even with the aid of a developer. The only situation I can think where this software would be of benefit is when wanting to quickly convert a PSD to a wireframe. If you’re serious about your new website and want it to not only look great, but be easily manageable in the future and SEO optimised, I highly recommend that you steer clear of this software and hire a professional to do it. You won’t regret it in the long run. 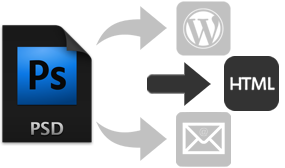 At BIOSTALL we offer PSD conversion as a service and are able to quickly and reliably convert your PSD’s to HTML, WordPress or an email newsletter at very competitive prices. Simply get in touch and we’ll be happy to help. This entry was posted on Tuesday, October 15th, 2013 at 4:28 pm by +Steve Marks and is filed under (X)HTML / CSS, Software, Web Development. You can follow any responses to this entry through the RSS 2.0 feed.